Keeping your lawn and landscape looking great is our top priority no matter the season. 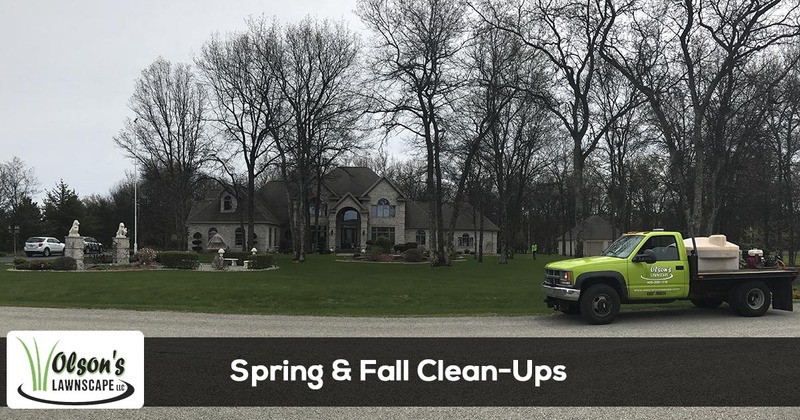 Our spring and fall clean up services are designed to transform your lawn and landscape while getting it ready to enjoy the season. Call us today at 906-399-1718 for a free quote. Have you ever walked around town and looked at a few landscapes and gardens while wondering what was wrong about them? You may have seen some beautiful designs ruined by a messy and untidy overall look. These are those lawns and landscapes which would look amazing if their owners had invested in regular spring and fall cleanups. If you think that raking or blowing over grass clippings after a Sunday mow is all you need to do to keep your property clean and neat, you should reconsider. Seasonal cleanups mean the removal of all lawn refuse, vegetal debris, trash, and inorganic debris, fallen leaves and so on in order to keep your property clean and healthy. What Happens if You Neglect Seasonal Cleanups? According to recent findings in horticulture, leaving the grass clippings on the lawn is considered beneficial – they make an organic supplemental source of nourishment for the soil. From this point of view, you have little to worry about. However, just as our body hygiene preserves our health, your lawn and landscape cleaning preserves their looks and functionality. If you leave spring vegetal debris lying around you risk to literally invite weeds, pests and spring diseases to evolve on your property, especially since vegetal leftovers are still moist or rotten. You risk allowing snow mold to evolve, together with mildew and rot diseases that can impact the healthy growth of spring vegetation. Fall cleanups are mandatory to protect your property from snow-related diseases and to keep pests and wildlife at bay. You really don’t want rats, mice and cockroaches roaming around just because you didn’t remove dead wet leaves from the ground. Constantly cleaning your property of organic and inorganic leftovers allows the soil to breathe, the sun’s light and warmth to reach the plants’ roots, fertilizers to infiltrate deep and weeds / pests to stay away from your turf. Our services are a part of our annual lawn and landscape maintenance program including the removal and disposal of all your undesirable lawn refuse. Our seasonal services should also be paired with our shrub pruning and perennial bed clearing services so you can make sure that your landscape is neat and rejuvenated and all vegetal leftovers are removed. We are a company that offers integrated lawn care and landscaping services that are sustainable, eco-friendly, affordable and in perfect compliance with horticultural standards. We cannot offer pest control services for instance but “forget” to offer seasonal cleanup services when we know very well that landscapes are micro eco-systems and failure in one area can lead to damages in another area. Our employees are specialized in their field of expertise and constantly trained to meet and exceed industry’s standards. They use the latest equipment and the best techniques so you can enjoy a lush and healthy landscape all year long. We use top of the line leaf blowers, vegetal debris collecting equipment, and safe inorganic leftovers removal techniques. No matter how hard or easy a cleanup intervention is, we also come with a $2 million insurance policy that guarantees our workers’ and your property’s safety. All our workers wear the proper uniforms and gear when implementing such services and all our vehicles and trucks are properly equipped to handle all possible tasks or problems. Using our 21 points checklist we make sure that each of our cleaning session is performed at the highest standards, that your property gates are closed after we leave and that there is no debris or environmental threat left behind. We offer a “No Payment” 100% risk-free warranty that backs up all our services: in case you are not happy with our work, you can call us back and resume it for free. If the results are still below your expectations you will pay us nothing. Give us a call today and ask for a free estimate! We will come down, assess the situation and design you a cleanup program to meet and exceed your needs, wishes and expectations!